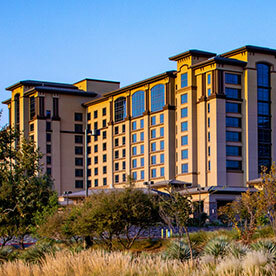 Cache Creek Casino Resort is owned and operated by the Yocha Dehe Wintun Nation, located in Brooks, California. Since its humble beginnings as a bingo hall in 1985, Cache Creek Casino Resort has grown to become one of Northern California's largest casino-resort destinations. Located 40 miles northwest of Sacramento and 80 miles from the San Francisco Bay Area, it features 2,700 slot machines, 120 table games, poker room, four-diamond hotel, nine restaurants, full-service spa, world-class entertainment in a 700-seat indoor concert venue and an 18-hole championship golf course/facility. On June 25, 1985, the Yocha Dehe Wintun Nation opened a modest bingo hall on their land in Brooks, California. The popularity of Cache Creek Indian Bingo & Casino soared immediately, and on October 7, 1993, the hall was expanded to include card games. A second expansion began in 1996 and was opened in phases in 1998 and 1999. The bingo hall now had a 1,200 seat capacity and three new restaurants, including China Camp and the 150-seat buffet. After California Governor Gray Davis signed the State Gaming Compact in 1999 the casino added slot machines and more table games, creating the most popular gaming facility in Northern California. The broad popularity of the casino meant only one thing - more expansion. In 2002, the tribe announced plans to build a $200 million property, renamed Cache Creek Casino Resort, on land adjacent to the existing facility. Completed and opened in 2004, the resort featured 200 hotel rooms, ten restaurants, the 700-seat Club 88, the 20,000 square-foot multi-purpose Event Center and 74,720 square feet of casino floor space. At build-out, the resort also included a lavish health spa, outdoor resort-style pool, an 18-hole championship golf course, 2,700 slot machines, 120 table games including a 14-table poker room, and a mini-mart. Then in May 2017, another expansion plan was unveiled, featuring 459 more hotel rooms, taking the overall resort total to 659 rooms. Additional features of the latest expansion include a multipurpose event/concert space, new restaurant, added meeting spaces, and a second pool. Completion of the project is expected in 2019. The Yocha Dehe Wintun Nation Tribal Council is the governing body of the Tribe. The Tribal Council consists of five members who are duly elected for three-year terms by the full Tribal Community Council, which includes all qualified voters 18 years and older. The Yocha Dehe Tribe is a sovereign Native American nation and is so recognized by the United States. Operating under the Tribe's own constitution and bylaws, the Tribal Council enacts laws that govern its own sovereign lands and enterprises. The Tribal Council oversees all areas of the tribal government and its business enterprises, evaluating and making final decisions with respect to the recommendations of the Tribe's various departments and committees. Tribal committees, boards of directors and commissions operate all areas of government and community life. These include the Yocha Dehe Wintun Academy, Yocha Dehe Fire Department, Yocha Dehe Community Fund, Yocha Dehe Farm and Ranch, Cultural Resources Department, Health and Wellness Department, Environmental Department, Tribal Gaming Agency, and Cache Creek Casino Resort. The Tribe enjoys a productive government-to-government relationship with the State of California and Yolo County. As the Tribe's governing body, the Tribal Council negotiates government-to-government agreements with the State, the County and local agencies. To date, these agreements govern the Tribe's entertainment and hospitality operations, and provide the State and County with fire, police and transportation infrastructure improvements throughout the region. In 2003, the Governor of California bestowed the Tribe with the State's highest and most prestigious environmental honor, the Governor's Environmental and Economic Leadership Award, in connection with its civil services agreement with Yolo County. The Tribe is also a signatory to an unprecedented Fire Mutual Aid Agreement. For the first time in Yolo County history, the Tribe's fire department is a contributing member of the County's emergency response force. Anthony Roberts is Tribal Chairman of the Yocha Dehe Wintun Nation. Elected Chairman in January 2018, he has served on the Tribal Council since 2000, and as Treasurer since 2006. Chairman Roberts is actively involved in the tribal community, serving as Chair of the Yocha Dehe Wintun Academy Board. He is Vice Chair of both the Cultural Resources and Facilities & Infrastructure Committees, and Treasurer of both the Fire Commission and the Community Fund Board. Chairman Roberts is also a member of the Health & Wellness and the Young Adult Assistance Program (YAAP) Committees. He formerly served as the Chairman and Commissioner of the Yocha Dehe Tribal Gaming Agency (TGA). As Chair of the Academy, Chairman Roberts is committed to helping Yocha Dehe youth connect with their ancestral heritage, further their education and participate in the businesses and leadership of the Tribe. He is also an advocate for the California Tribal College to provide education opportunities for tribal members throughout California. As former Chair of the Community Fund Board, Chairman Roberts believes strongly in the Native tradition of giving and is gratified by the positive impact the Fund has had in the region. He is a strong advocate for Autism Speaks, which focuses on funding, awareness, advocacy, research and treatment for individuals with autism and their families. Chairman Roberts actively serves the greater Yolo County community as a Director of the Yolo County Fair Board, a post to which he was appointed in 2012 by Governor Edmund G. Brown, Jr. Chairman Roberts has lived in the tribal community for most of his life. He is an avid sports fan and participates in an organized basketball league.